7:00 a.m. This morning started with the expectation of a nice work-from-home day. I would start with my Urth Caffe maximum dark roast “Old Gandpa” done by pour-over. The plan was, as usual, to sip at the luxurious dark brown liquid while I ponder the complexity of moving humanity into the future on a predetermined path which will improve the lot of all life forms while doing the bidding of the Universe in battling entropy. Simple but rewarding stuff. 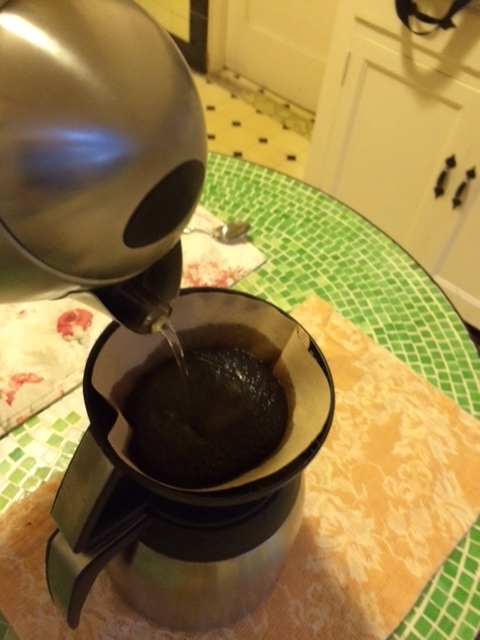 I pre-warmed the Melitta Carafe and ground the nearly coal black beans in a Titan conical burr grinder. 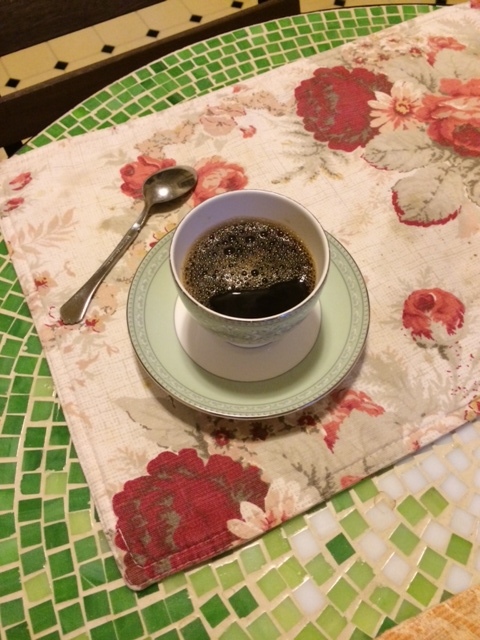 As the 208 degree F filtered water slowly made the ground coffee rise and bloom I started to anticipate the taste and the inspiration which would follow. (I have a theory that a good, strong dark roast can increase one’s I.Q. by twenty or more points.) It was not to be however as I noticed that I had a text message awaiting me. Actually it had come in an hour and a half earlier. It was from my most senior employee (we actually call him “senior”), the guy who opens up the shop. He was not going to be able to open up due to a rather severe cold. That meant that one of the other guys had already been waiting outside for half an hour. After acknowledging the disappointment and appologizing to the Universe for a creative morning lost, I finished the pour-over. 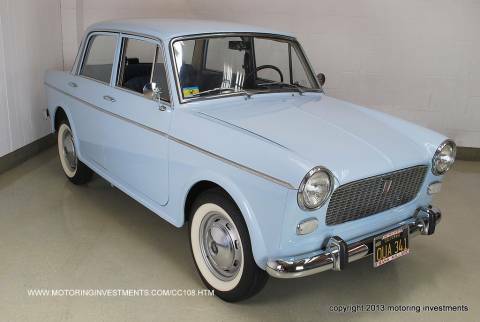 I then threw on some clothes, gathered up all of the items I needed to bring (especially my iPad in case I found any time away from the shop and I could steal a few minutes of writing) and headed out to my 1930’s carriage house to awaken the ’64 Fiat 1100d which was my chosen steed for the morning. With a slight pull of the choke she was nudged awake. I was so happy that her last owner and restorer, the piano tuner by trade, had installed the retractible shoulder belts. This, because my Melitta carafe was safely secured on the passenger seat next to me. I was awake now since I did manage to pour down a light green Wedgewood cup full of the black inspiration while I dressed. I detest rush hour. This is why, when I plan to go into the office I leave the house at approximately ten minutes before 6 o’clock. This is the window that I have determined gives the most unencumbered drive from La Mesa to downtown. I was far outside that window this morning. I tend to drive a bit too fast and the positive note here is that the Fiat, with her 1100cc engine allows (forces) me to slow down. I can just sit in the number thee lane and motor along with the flow rather than attempt to exploit any gap in traffic. As it turned out even the Fiat was too fast for this morning’s traffic flow. I opened the shop, took care of some business and once the rest of the staff was in decided to resume my work-at-home day. I started to look forward to the afternoon coffee when I would abandon work and get back to thoughts and writing. I would sit at the wooden table under the trees in the rather unkept (I call it natural) area near the center of my two acres of heaven-in-La Mesa. I tucked the Fiat away, resumed work and was counting down the minutes to about 3 o’clock when I would start my creative afternoon period. Phone rings. It seems a maiden has a Mercedes battery in distress. Damn. It is “don my shiny amour and mount the white steed and go forth and do great deeds”. Well I do not have a horse, white or otherwise so my ’62 British Ford Cortina will have to do even though she is lime green. Jumper cables in the boot I row the 4 speed column shift and use all of her 1200 cubes to keep up in the number 2 lane on the way to La Jolla. I can see the headlines now on the Bing search page, “fifty-five year old Brit breaths life into hot twenty-seven year old German”. Well, it was all worthwhile, a minor adventure and in the grand scheme of things the Universe only lost one creative day out of hundreds of billions, maybe hundreds of trillions.